Abandoned by Aborigines a few thousand years ago, Kangaroo Island attracts over 140,000 visitors each year. Flinders Chase National Park is a big draw for nature gazing, so bring your hiking boots and camera to capture images of koalas, kangaroos, and other protected wildlife. One species plays an important role in the economy, namely the Ligurian honey bee. These little workers produce some of the best honey in the world. The amount of recognition that the bees have brought the island is ironic considering the first settlers made their living off the hunting and export of whales and seals. Nowadays, these two species are protected and live peacefully along the shores of the island paradise. Kangaroo Island is in South Australia. 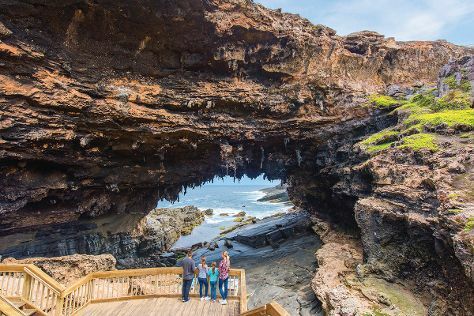 Our Australia trip builder tool allows you to schedule your trip to Kangaroo Island, learn about its attractions, and find out about where else to go during your holiday. Although most of Kangaroo Island remains relatively underdeveloped in a commercial sense, you'll find lodgings that include everything from spacious suites to economical hostels in communities like Penneshaw and Kingscote. The most expensive accommodations on the island, private cottages and beach houses near the water generally require a two-night minimum stay. For something more flexible and less expensive, consider one of the local campgrounds, many of which offer powered and unpowered sites, as well as cozy log cabins ideal for couples and families with kids. Kangaroo Island, 13 kilometres (8 miles) off the coast of South Australia and 30 minutes by plane from Adelaide, is brimming with native animals, some of which aren't found anywhere else. It is also home to an established artisanal food scene, and one of the world's best hotels. More than one third of the island is protected by conservation areas and national parks, while lush farmland and small towns make up much of the rest. The island, known to the locals as "KI", is divided into seven regions, with four major towns: Kingscote (the island’s relaxed capital), Penneshaw (where daily ferries disembark), American River, and Parndana.